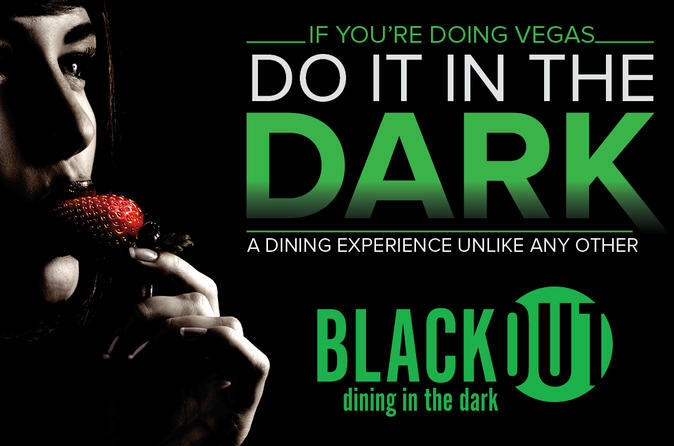 Embark on a culinary adventure like no other at BLACKOUT, a fascinating dining attraction just off the Las Vegas Strip. Sitting in total darkness, your sense of taste and smell are completely heightened as you feast on a multi-course meal of wonderful specialties. With a choice of lunch or dinner, you'll taste and touch your way one plate at a time. Each robust course—while unknown to you at first—offers a symphony of flavors created to awaken your senses! Upon arrival at BLACKOUT, you're greeted by the friendly staff who first explain the dining process in detail. If you haven't advised of any allergies or restrictions please inform the host at that time. You'll then select your meal based on your choice of a sweet, spicy, or savory menu. With your cell phone and other light-emitting devices secured in a locker, you're led into the pitch-black dining room — a special space designed to eliminate all outside sources of light. Once the staff ensures you're safely sat at your table, your meal can begin. Taste and touch your way through a 4-course lunch or 6-course dinner, one plate at a time. Each robust course—while unknown to you at first—offers a symphony of flavors created to awaken your senses. You're sure to be surprised as you become acquainted with this new environment, as well as first-class delicacies you may never have had before. At the end of your meal, the staff escorts you back to the lobby, where you're free to take time to let your eyes adjust to the light. This is truly a unique sensory experience that you won't soon forget.